This is my fourth free build of the month, so approvals and critiques are most welcome. Even though Weelond is still too small of a town to gain any immediate benefit from properties in the hinterlands of An Holli, Weelond’s new mayor knew that that time would come. Additionally, Willem Guilder was a company man for the MCTC through and through. 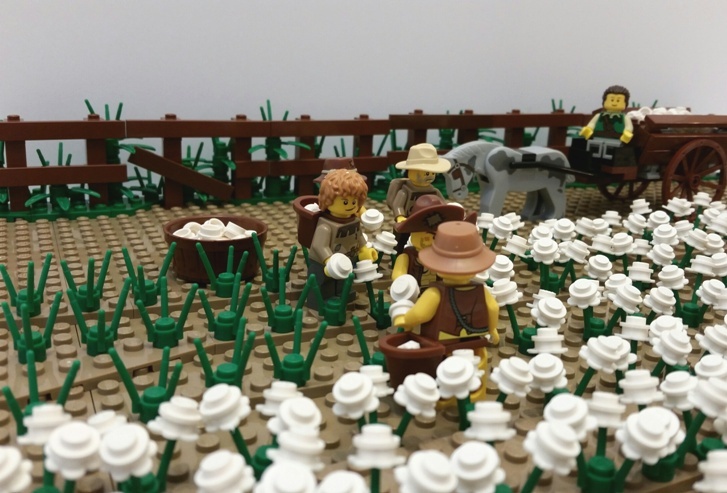 So, to take advantage of the MCTC’s cotton monopoly, Guilder bought some prime land not far from town and set up a medium-sized cotton plantation. The growing season is apparently surprisingly short, as his workers are already busy picking cotton! Once the crop comes in, he plans on expanding the plantation even more. I am ineligible for the rebates offered for building and licensing properties in Weelond this month, so the rebates are still available. The next two properties licensed in Weelond in February by MCTC members who have not previously built in Weelond will get 2db back (from me). Additionally, at the end of the month, I'll award an extra 3db to the best non-residential property licensed in Weelond. The citizens of Weelond are particularly in need of artisan’s shops! 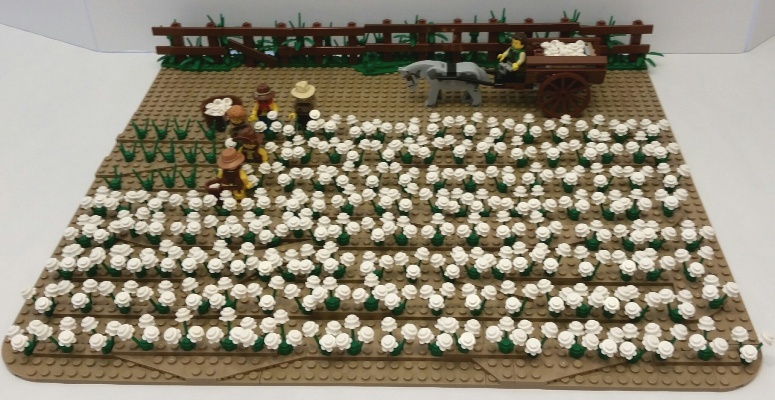 Very nice plantation Capt Wolf, I really like how the flowers with 1x1 round white pieces look - now to try it out myself! The fence in the behind with the weeds growing on the other side of it is great! I second this. Very nice build sir! I'm really loving it! "Hmmm. Now... where have I seen this before? Oh-h-h, I remember! This is just the way - "
Uh, oops. I went a little too far with that quote. Lovely plantation! (Or what you've built of it anyway...) The ground looks pretty good, especially the rounded front corners, and I like that you've varied the terrain a little rather than just covering a 32x32 baseplate with plants, which would be lazy too easy. The fence in the back is nice, although someone needs to nail that loose board up pronto. Overall it's a very nice scene, and apparently they live by the motto "Be prepared!" Uh-oh. 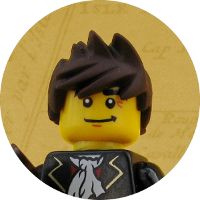 First I picked on Garmadon's plantation (sorry, Garm! ) and now I'm doing it to you. Hey, I'm a farmer. I can't help it! The stems would look better, ie more accurate, if they were tan instead of green, because the plants are typically drying up by harvesttime. And the flower head at the base of each boll would also look better in tan - if only Lego offered them in that color. 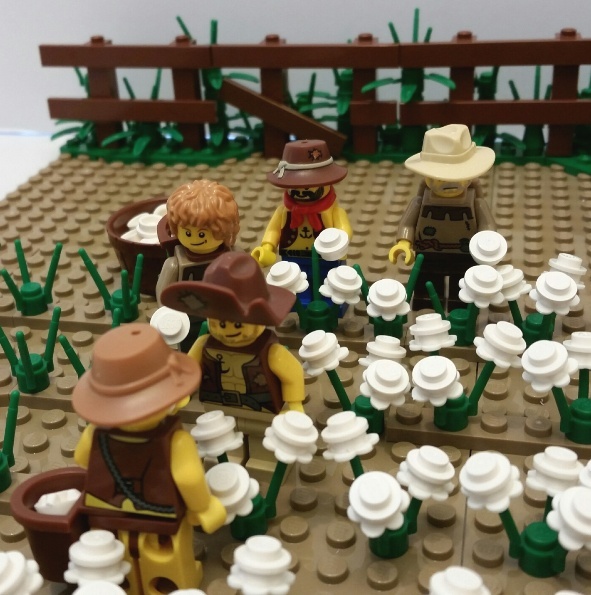 The plants would also look better if each one consisted of about 3 flower stems stacked together, but then they'd be waaay too tall for the minifigs, so this is a happy compromise. But none of this is really a big deal though - we all understand the limitations of working with those parts, and it comes across well as shown. I like it. 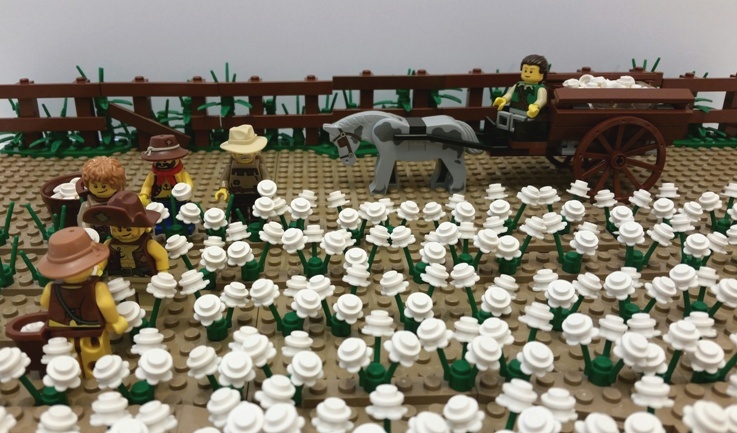 You've also done a good job with the minifigs and the horse cart, but man, they've got a long way to go to finish that field! Hard, hot, dirty, itchy, sweaty work. Perhaps it will go quicker if they all sing "I've got a lovely bunch of cotton bolls, toodly-doo..."
If I were the photographer, I'd tell that one fella "Don't turn your back on me!" Well, that's enough. But I have "a marvelous surprise for you!" looks like a Cotton pickin' good time! Great plants! I really like IT! Yeap, a nice plantation and another proof that flowers with round plates, look great! Only nitpick is that the road could have had some more details. Looks like they'll be busy for a while. It's a really nice build. I love the fence in the background and the fact that part of the field has already been harvested. The ground is a little too simple for my taste; perhaps you could add some groves in the dirt road from the heavy wagons. Do you have any pics of the wagon? It looks like the sides angle outwards, but I can't tell for certain. I love this build. You must have spent hours 'growing' that cotton, I wouldn't have had the patience. Both the plants and the harvested bolls look very effective. In fact everything about this build looks perfect, I can't think of a single improvement you could make. But as this is a new plantation, I think Guilder's getting scammed by his fencing contractor! By the way, on the 'skills tree' rules page it says there is a skill award for 'agriculture' skills, I think you should apply. I have no idea how you do that though! PS: On the main intro page I have just nominated you to the process for the agriculture skill tree, whatever it is, maybe this will kick start the process? Thanks to everyone for the kind words on the build! I really like how the flowers with 1x1 round white pieces look - now to try it out myself! Thanks! The 1x1 plate on the flower was Gedren_Y's idea in another thread, and I had to try it. And the fence was critical to this build; I had to have something more than just cotton plants! The stems would look better, ie more accurate, if they were tan instead of green, because the plants are typically drying up by harvesttime. I actually have one (just one!) brown plant stem piece, and I agree it would look better than the green. However, I looked on Bricklink, and there are only 13 stems total for sale, at an average price of over $5 per piece. Not gonna happen! I used every dark tan piece I could. Given that a lot of the plates are hidden under the cotton plants, maybe I should have used them on the road instead. I was in a no-win situation based on my available pieces. I would have liked to add more texture in the field, and I agree that the road definitely needs something. Ask and you shall receive. Here are a couple of pictures of the wagon. The sides do angle out. Again, thanks for the comments! I appreciate the feedback. FYI, I'm licensing this as a medium-sized plantation, and my plan is to expand it to a large plantation in the future by adding new segments that are being cleared of wild vegetation and plowed. 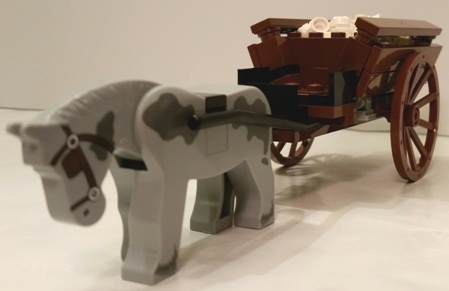 Anybody have any ideas on how to make a Lego plow? A moldboard plow in minifig scale would be extremely difficult. I've thought about it before and can't come up with a satisfactory design. A disc plow (yes, there is such a thing - and it's not a disc harrow) would be really easy - but it doesn't fit the time period. My advice is simple: build a good plow frame without the moldboard plowshares, and build the accompanying scene to show plowing in action, because the plowshares would be mostly buried and only visible in the back, which would be pretty easy to work around. Once you have a suitable frame you could always experiment with the curved plowshares if you absolutely had to have them. If anyone has a better idea I'd love to hear it. I like this plantation very much. The cart is very well done and as mentioned the fence gives the build extra character. If you are not a purist, altbricks do tan and what they call 'medium tan' stem pieces - might be another option? 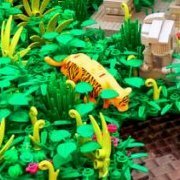 I have some of their leaf pieces -the plastic is more brittle than real lego, but other than that I have no complaints and they do a variety of colours available in large quanties (something that is sometimes rare in any one bricklink store). Cap Wolf: The wagon is superb. The road could easily be improved with adding some small rocks (1x1 round and square flat in different shades of grey). It is logical as well, if they cleared the cotton fields for rocks. I don't know if cotton fields needs clearing the land, but in agriculture I know about this is one of the ways excess rocks can be used, along with foundation for stone walls and buildings. Awesome build, I really like the cotton, that really must have taken a lot of patience. Nice use of the flower middles filing up the cart (I can never bring myself to throw those away). Short answer here, great MOC, great composition, maybe for next time I'd wish for a little more 'imperfection' along the driveway, simply some sprinkled pieces of 'dirt'. Love the broken fence. Great job on your plantation, though I have to admit my favourite part is the fence with the vegetation behind it. I'm glad you were able to take my idea and execute it so well. I also like that you used a sloped field planting method, which is good for irrigation. The cart design is well done, too. Captain Dee, the Lego plough shown here may not be entirely anatomically correct but looks spot on to me. Great looking plantation. I like the scale of it, which just gives it that little extra compared to a smaller example. The rows of plants are great, and the activity going on so too, and the fence and wagon are looking perfect! Well done - I approve. 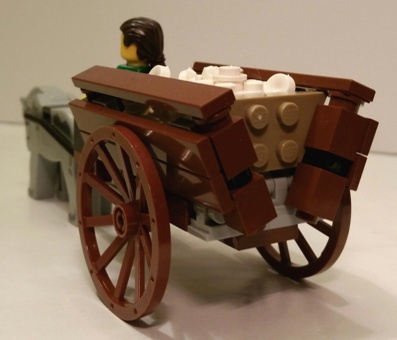 The Lego plough shown here may not be entirely anatomically correct but looks spot on to me. The road could easily be improved with adding some small rocks (1x1 round and square flat in different shades of grey). It is logical as well, if they cleared the cotton fields for rocks. I don't know if cotton fields needs clearing the land, but in agriculture I know about this is one of the ways excess rocks can be used, along with foundation for stone walls and buildings. Thanks for the suggestion. When I expand this to a large plantation, I will enhance the road in this fashion.